DIE Lunæ, videlicet, 4 die Julii. Examinations about Muschamp's Threats against the Earl of Northumberland. Message from the H. C. about the Alterations desired in the Scots Treaty. Portuguese Ambassador desires a Ship to carry him Home. and for the Letters from Holland to be returned to them. Ordinance for raising Men and Horse for Ireland. Message to the H. C. with the Instructions for Rutlandshire, and the Instructions for raising Horse. Words against the Parliament by Elliot. Message to the H. C. for a Conference about them. Escott, for Words against the Parliament. Letter from the Earl of Exeter. Herbert and Saul examined, about proclaiming the Commission of Array. Attorney General to be brought before the House. Message to the H. C. to fit a while. Conference about the Fleet reported. Committee to consider of an Indemnity to the Earl of Warwick, for seizing on some of the King's Ships. Clause for the Earl of Warwick in the Declaration. Declaration and Amendments approved of. Sent to the H. C.
Sir Jo. Mennes and others, Captains in the Fleet, sent for as Delinquents. E. of Warwick to put Persons of Trust in their Commands. Declaration of Thanks to him, and the Officers and Seamen under him. Message from the H. C. to appoint a Committee to preserve the Peace, and consider of the Safety of the Kingdom. and with Names of Deputy Lieutenants. The King's Letter to the Earl of Warwick, revoking his Commission of Admiral. 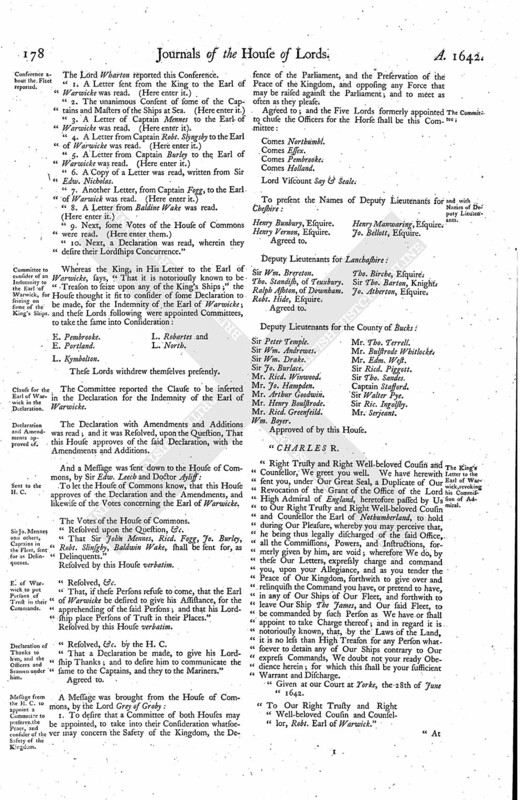 Resolution of several Commanders, at a Council of War, to act under the Earl of Warwick's Command. Sir John Mennes's Letter to the Earl of Warwick, that he is commanded by the King to put himself and Squadron under the Command of Sir John Pennington. From aboard His Majesty's Ship The Garland, in The Downes, July, 1642. From aboard The Anthelopp, in The Downes, this 2d of July, 1642. Secretary Nicholas's Letter, for the Ship to carry Home the Portuguese Ambassador. Capt. Fogg's Letter to the Earl of Warwick. Downes, on board His Majesty's Ship The Constant Reformation, 2 July, 1642. Capt. Wake's Letter to the Earl of Warwick. Sir John Mennes's Second Letter to the Earl of Warwick. Order for the Captain of The Garland to carry Home the Portuguese Ambassador. A Declaration to the Earl of Warwick, wherein he is required to send up Five Commanders, viz. Sir John Mennes, &c.
Cumberland and Westmoreland Militia to be put in Execution. Message from the H. C. with an Order for the Sea Adventurers for Ireland. The Earl of Holland reported from the Committee the Examination of Oliver Royston, concerning the Words which Edmond Muschamp spoke, touching the Earl of Northumberland. "That Muschamp was confronted with these Witnesses, and he could not answer any Thing for himself; neither did he confess any Thing; and the Witnesses did justify what they have deponed. "That Muschamp did confess on Saturday, that he asked the Party who he would have had to be his Servant, whether (fn. 1) he were a good Marksman; and being asked why he asked that Question, he said, Because he was a Soldier." Hereupon this House Ordered, That the said Edmond Muschamp shall be committed to the Prison of The Gatehouse, there to remain until the Pleasure of this House be further known, and the Business further examined; and the Lord Chief Justice is to examine what Credit the said Muscamp hath where he lives. 1. Whereas their Lordships sent down a Paper on Saturday last, being an Alteration in the Twelfth Article of the Treaty with the Scotts, the House of Commons thinks it fit to insist upon the Article as it was, without the Alteration. Agreed to with the House of Commons, to insist upon the Twelfth Article. 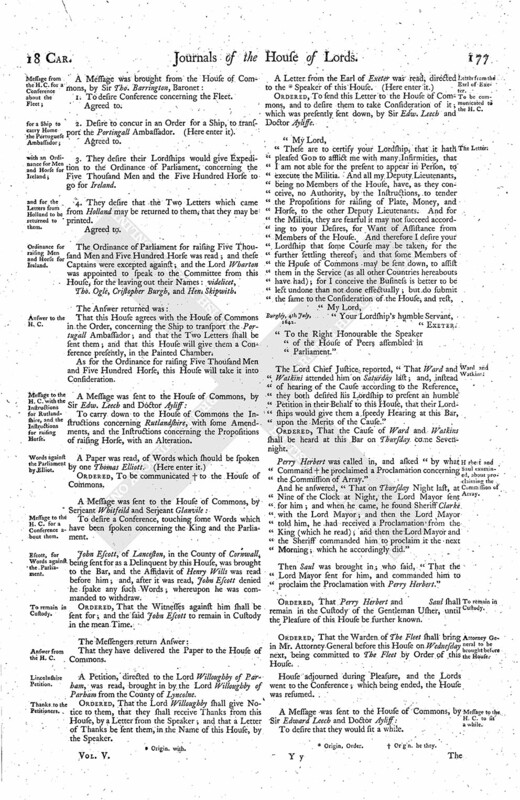 ["It is Agreed, That the Towns of Carrickfergus and Colerayne shall, by the Kingdom of England, be, with all Expedition, provided with Victuals necessary for Soldiers, either in Garrisons or Expeditions, according to a List to be agreed on; and that the same shall be sold to them, and taken off by them, at the several Prices contained in the aforesaid List"]. ["And that such Quantities thereof as the Scotch Army shall have Occasion to use, shall be sold unto them, and bought by them, at the several Prices contained in the aforesaid List"]. Ordered, That this House agrees with the House of Commons to the abovesaid Amendment, as it is now in the Seventh Article. The Earl of Northumberl. acquainted this House, "That the Portugall Ambassador desired his Lordship to acquaint this House with a Desire of his, that he might have a Ship appointed, to carry him Home into Portugall." And this House appointed the Earl of Northumb. to let the Ambassador know, that this House will take it into Consideration. 1. To desire Conference concerning the Fleet. 2. Desire to concur in an Order for a Ship, to transport the Portingall Ambassador. (Here enter it). 3. They desire their Lordships would give Expedition to the Ordinance of Parliament, concerning the Five Thousand Men and the Five Hundred Horse to go for Ireland. 4. They desire that the Two Letters which came from Holland may be returned to them, that they may be printed. Tho. Ogle, Cristopher Burgh, and Hen. Skipwith. That this House agrees with the House of Commons in the Order, concerning the Ship to transport the Portugall Ambassador; and that the Two Letters shall be sent them; and that this House will give them a Conference presently, in the Painted Chamber. As for the Ordinance for raising Five Thousand Men and Five Hundred Horse, this House will take it into Consideration. To carry down to the House of Commons the Instructions concerning Rutlandshire, with some Amendments, and the Instructions concerning the Propositions of raising Horse, with an Alteration. Ordered, To be communicated (fn. 2) to the House of Commons. To desire a Conference, touching some Words which have been spoken concerning the King and the Parliament. John Escott, of Lanceston, in the County of Cornwall, being sent for as a Delinquent by this House, was brought to the Bar, and the Affidavit of Henry Wills was read before him; and, after it was read, John Escott denied he spake any such Words; whereupon he was commanded to withdraw. Ordered, That the Witnesses against him shall be sent for; and the said John Escott to remain in Custody in the mean Time. That they have delivered the Paper to the House of Commons. 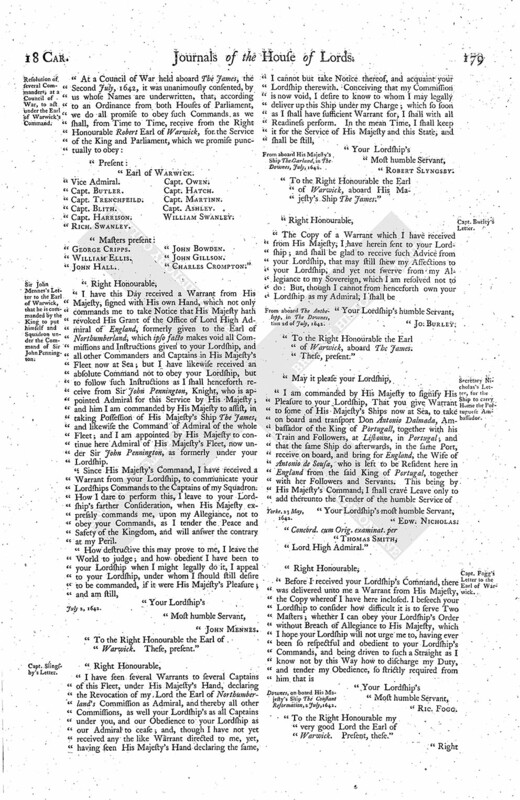 A Petition, directed to the Lord Willoughby of Parham, was read, brought in by the Lord Willoughby of Parham from the County of Lyncolne. Ordered, That the Lord Willoughby shall give Notice to them, that they shall receive Thanks from this House, by a Letter from the Speaker; and that a Letter of Thanks be sent them, in the Name of this House, by the Speaker. Ordered, To send this Letter to the House of Commons, and to desire them to take Consideration of it; which was presently sent down, by Sir Edw. Leech and Doctor Ayliffe. "To the Right Honourable the Speaker of the House of Peers assembled in Parliament." The Lord Chief Justice reported, "That Ward and Watkins attended him on Saturday last; and, instead of hearing of the Cause according to the Reference, they both desired his Lordship to present an humble Petition in their Behalf to this House, that their Lordships would give them a speedy Hearing at this Bar, upon the Merits of the Cause." Ordered, That the Cause of Ward and Watkins shall be heard at this Bar on Thursday come Sevennight. Perry Herbert was called in, and asked "by what Command (fn. 4) he proclaimed a Proclamation concerning the Commission of Array." And he answered, "That on Thursday Night last, at Nine of the Clock at Night, the Lord Mayor sent for him; and when he came, he found Sheriff Clarke with the Lord Mayor; and then the Lord Mayor told him, he had received a Proclamation from the King (which he read); and then the Lord Mayor and the Sheriff commanded him to proclaim it the next Morning; which he accordingly did." Then Saul was brought in; who said, "That the Lord Mayor sent for him, and commanded him to proclaim the Proclamation with Perry Herbert." Ordered, That Perry Herbert and Saul shall remain in the Custody of the Gentleman Usher, until the Pleasure of this House be further known. Ordered, That the Warden of The Fleet shall bring in Mr. Attorney General before this House on Wednesday next, being committed to The Fleet by Order of this House. House adjourned during Pleasure, and the Lords went to the Conference; which being ended, the House was resumed. To desire that they would fit a while. The Lord Wharton reported this Conference. "3. A Letter of Captain Mennes to the Earl of Warwicke was read. (Here enter it). "6. A Copy of a Letter was read, written from Sir Edw. Nicholas. "10. Next, a Declaration was read, wherein they desire their Lordships Concurrence." These Lords withdrew themselves presently. The Committee reported the Clause to be inserted in the Declaration for the Indemnity of the Earl of Warwicke. The Declaration with Amendments and Additions was read; and it was Resolved, upon the Question, That this House approves of the said Declaration, with the Amendments and Additions. To let the House of Commons know, that this House approves of the Declaration and the Amendments, and likewise of the Votes concerning the Earl of Warwicke. The Votes of the House of Commons. "Resolved upon the Question, &c.
"That Sir John Mennes, Ricd. Fogg, Jo. Burley, Robt. Slinsgby, Baldwin Wake, shall be sent for, as Delinquents." Resolved by this House verbatim. "That, if these Persons refuse to come, that the Earl of Warwicke be desired to give his Assistance, for the apprehending of the said Persons; and that his Lordship place Persons of Trust in their Places." "Resolved, &c. by the H. C.
"That a Declaration be made, to give his Lordship Thanks; and to desire him to communicate the same to the Captains, and they to the Mariners." 1. 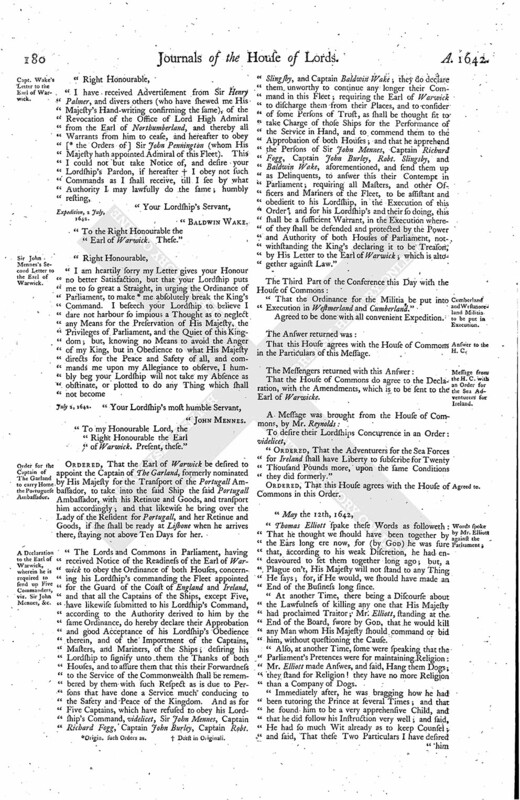 To desire that a Committee of both Houses may be appointed, to take into their Consideration whatsoever may concern the Safety of the Kingdom, the Defence of the Parliament, and the Preservation of the Peace of the Kingdom, and opposing any Force that may be raised against the Parliament; and to meet as often as they please. Lord Viscount Say & Seale. Robt. Hide, Esquire. Tho. Birche, Esquire. Wm. Boyer. Mr. Tho. Terrell. Approved of by this House. "Right Trusty and Right Well-beloved Cousin and Counsellor, We greet you well. We have herewith sent you, under Our Great Seal, a Duplicate of Our Revocation of the Grant of the Office of the Lord High Admiral of England, heretofore passed by Us to Our Right Trusty and Right Well-beloved Cousin and Counsellor the Earl of Nothumberland, to hold during Our Pleasure, whereby you may perceive that, he being thus legally discharged of the said Office, all the Commissions, Powers, and Instructions, formerly given by him, are void; wherefore We do, by these Our Letters, expressly charge and command you, upon your Allegiance, and as you tender the Peace of Our Kingdom, forthwith to give over and relinquish the Command you have, or pretend to have, in any of Our Ships of Our Fleet, and forthwith to leave Our Ship The James, and Our said Fleet, to be commanded by such Person as We have or shall appoint to take Charge thereof; and in regard it is notoriously known, that, by the Laws of the Land, it is no less than High Treason for any Person whatsoever to detain any of Our Ships contrary to Our express Commands, We doubt not your ready Obedience herein; for which this shall be your sufficient Warrant and Discharge. "Given at our Court at Yorke, the 28th of June 1642. "To Our Right Trusty and Right Well-beloved Cousin and Counsellor, Robt. Earl of Warwick." 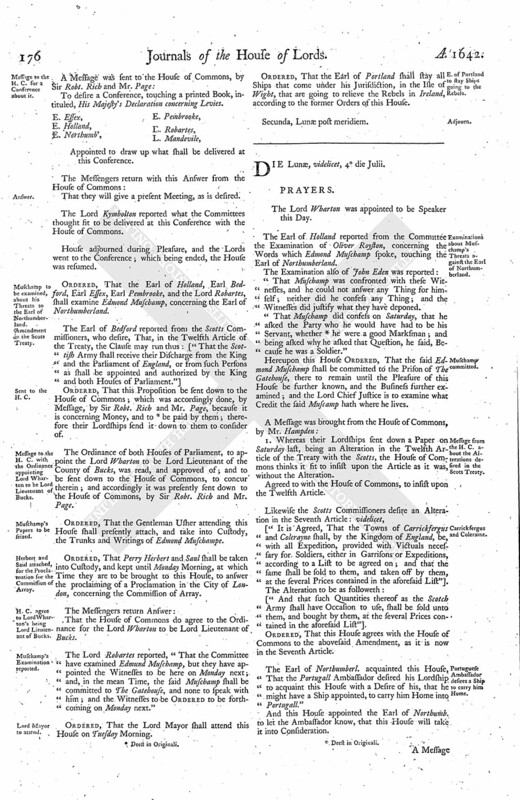 "I have this Day received a Warrant from His Majesty, signed with His own Hand, which not only commands me to take Notice that His Majesty hath revoked His Grant of the Office of Lord High Admiral of England, formerly given to the Earl of Northumberland, which ipso facto makes void all Commissions and Instructions given to your Lordship, and all other Commanders and Captains in His Majesty's Fleet now at Sea; but I have likewise received an absolute Command not to obey your Lordship, but to follow such Instructions as I shall henceforth receive from Sir John Pennington, Knight, who is appointed Admiral for this Service by His Majesty; and him I am commanded by His Majesty to assist, in taking Possession of His Majesty's Ship The James, and likewise the Command of Admiral of the whole Fleet; and I am appointed by His Majesty to continue here Admiral of His Majesty's Fleet, now under Sir John Pennington, as formerly under your Lordship. "Since His Majesty's Command, I have received a Warrant from your Lordship, to communicate your Lordships Commands to the Captains of my Squadron. How I dare to perform this, I leave to your Lordship's farther Consideration, when His Majesty expressly commands me, upon my Allegiance, not to obey your Commands, as I tender the Peace and Safety of the Kingdom, and will answer the contrary at my Peril. "To the Right Honourable the Earl of Warwick. These, present." "To the Right Honourable the Earl of Warwick, aboard His Majesty's Ship The James." "To the Right Honourable the Earl of Warwick, aboard The James. These, present." "Your Lordship's Most humble Servant, Ric. Fogg. "To the Right Honourable my very good Lord the Earl of Warwick. Present, these." "Your Lordship's Servant, "Baldwin Wake. "To the Right Honourable the Earl of Warwick. These." "To my Honourable Lord, the Right Honourable the Earl of Warwick. Present, these." Ordered, That the Earl of Warwick be desired to appoint the Captain of The Garland, formerly nominated by His Majesty for the Transport of the Portugall Ambassador, to take into the said Ship the said Portugall Ambassador, with his Retinue and Goods, and transport him accordingly; and that likewise he bring over the Lady of the Resident for Portugall, and her Retinue and Goods, if she shall be ready at Lisbone when he arrives there, staying not above Ten Days for her. 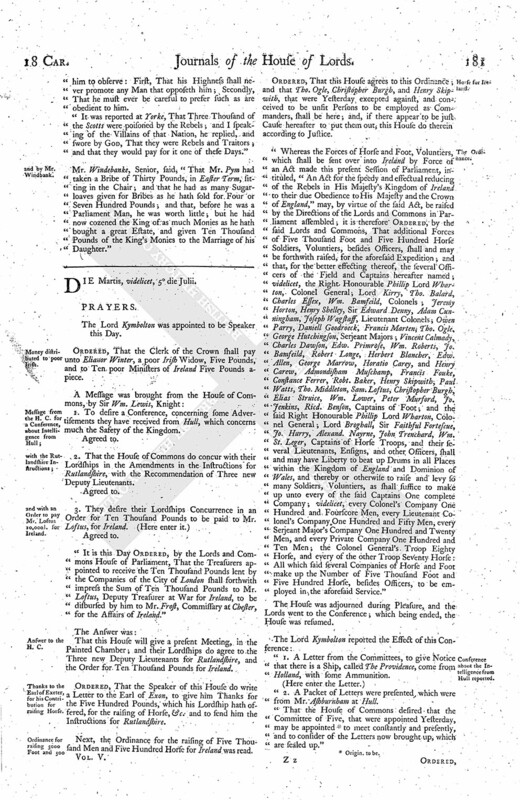 "The Lords and Commons in Parliament, having received Notice of the Readiness of the Earl of Warwick to obey the Ordinance of both Houses, concerning his Lordship's commanding the Fleet appointed for the Guard of the Coast of England and Ireland, and that all the Captains of the Ships, except Five, have likewise submitted to his Lordship's Command, according to the Authority derived to him by the same Ordinance, do hereby declare their Approbation and good Acceptance of his Lordship's Obedience therein, and of the Importment of the Captains, Masters, and Mariners, of the Ships; desiring his Lordship to signify unto them the Thanks of both Houses, and to assure them that this their Forwardness to the Service of the Commonwealth shall be remembered by them with such Respect as is due to Persons that have done a Service much conducing to the Safety and Peace of the Kingdom. And as for Five Captains, which have refused to obey his Lordship's Command, videlicet, Sir John Mennes, Captain Richard Fogg, Captain John Burley, Captain Robt. Slingsby, and Captain Baldwin Wake; they do declare them unworthy to continue any longer their Command in this Fleet; requiring the Earl of Warwick to discharge them from their Places, and to consider of some Persons of Trust, as shall be thought fit to take Charge of those Ships for the Performance of the Service in Hand, and to commend them to the Approbation of both Houses; and that he apprehend the Persons of Sir John Mennes, Captain Richard Fogg, Captain John Burley, Robt. Slingsby, and Baldwin Wake, aforementioned, and send them up as Delinquents, to answer this their Contempt in Parliament; requiring all Masters, and other Officers and Mariners of the Fleet, to be assistant and obedient to his Lordship, in the Execution of this Order; and for his Lordship's and their so doing, this shall be a sufficient Warrant, in the Execution whereof they shall be defended and protected by the Power and Authority of both Houses of Parliament, notwithstanding the King's declaring it to be Treason, by His Letter to the Earl of Warwick; which is altogether against Law." "That the Ordinance for the Militia be put into Execution in Westmerland and Cumberland." Agreed to be done with all convenient Expedition. That this House agrees with the House of Commons in the Particulars of this Message. That the House of Commons do agree to the Declaration, with the Amendments, which is to be sent to the Earl of Warwicke. "Ordered, That the Adventurers for the Sea Forces for Ireland shall have Liberty to subscribe for Twenty Thousand Pounds more, upon the same Conditions they did formerly." "Thomas Elliott spake these Words as followeth: That he thought we should have been together by the Ears long ere now, for (by God) he was sure that, according to his weak Discretion, he had endeavoured to set them together long ago; but, a Plague on't, His Majesty will not stand to any Thing He says; for, if He would, we should have made an End of the Business long since. "At another Time, there being a Discourse about the Lawfulness of killing any one that His Majesty had proclaimed Traitor; Mr. Elliott, standing at the End of the Board, swore by God, that he would kill any Man whom His Majesty should command or bid him, without questioning the Cause. "Also, at another Time, some were speaking that the Parliament's Pretences were for maintaining Religion: Mr. Elliott made Answer, and said, Hang them Dogs; they stand for Religion! they have no more Religion than a Company of Dogs. "Immediately after, he was bragging how he had been tutoring the Prince at several Times; and that he found him to be a very apprehensive Child, and that he did follow his Instruction very well; and said, He had so much Wit already as to keep Counsel; and said, That these Two Particulars I have desired him to observe: First, That his Highness shall never promote any Man that opposeth him; Secondly, That he must ever be careful to prefer such as are obedient to him. "It was reported at Yorke, That Three Thousand of the Scotts were poisoned by the Rebels; and I speaking of the Villains of that Nation, he replied, and swore by God, That they were Rebels and Traitors; and that they would pay for it one of these Days." Mr. Windebanke, Senior, said, "That Mr. Pym had taken a Bribe of Thirty Pounds, in Easter Term, sitting in the Chair; and that he had as many Sugarloaves given for Bribes as he hath sold for Four or Seven Hundred Pounds; and that, before he was a Parliament Man, he was worth little; but he had now cozened the King of as much Monies as he hath bought a great Estate, and given Ten Thousand Pounds of the King's Monies to the Marriage of his Daughter." 5. Origin. such Orders as.